Presidents Challenge is a fun and diverting way to memorize the names of the presidents of the United States in order. Users can choose to tackle specific eras or the entire list at once. There is a blank timeline with the year of election on one side of the screen, and a tray of presidential portraits with names on the other side. Users drag pictures from the tray to the correct place on the timeline. 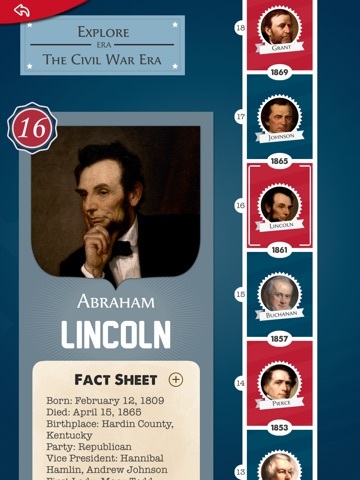 The app also provides a little biographical and background information about each president. 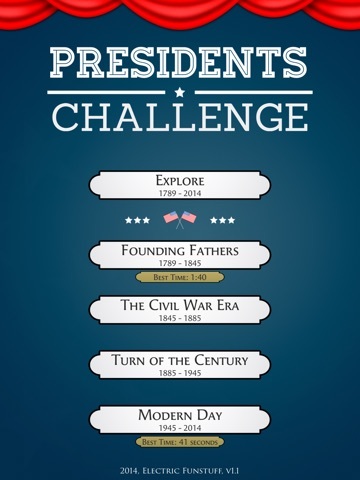 Presidents Challenge is included in our round up of Kids Apps for President’s Day. Presidents Challenge provides a fun way to practice a common task from history class: memorizing the names of the Presidents in order. The app is very easy to use and performs exactly as expected. The graphics are outstanding and the period music used in each section is enjoyable to listen to. All in all, it’s a very engaging way to practice a rather tedious task. 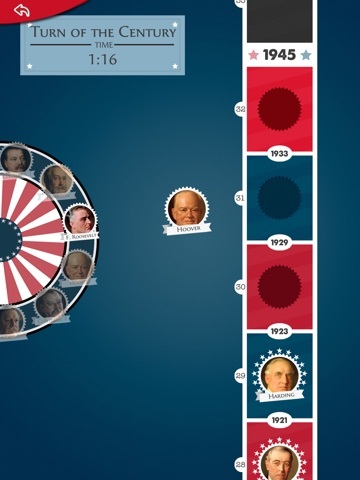 This app is enjoyable and fun, and also uses some sound techniques to help players memorize the Presidents. 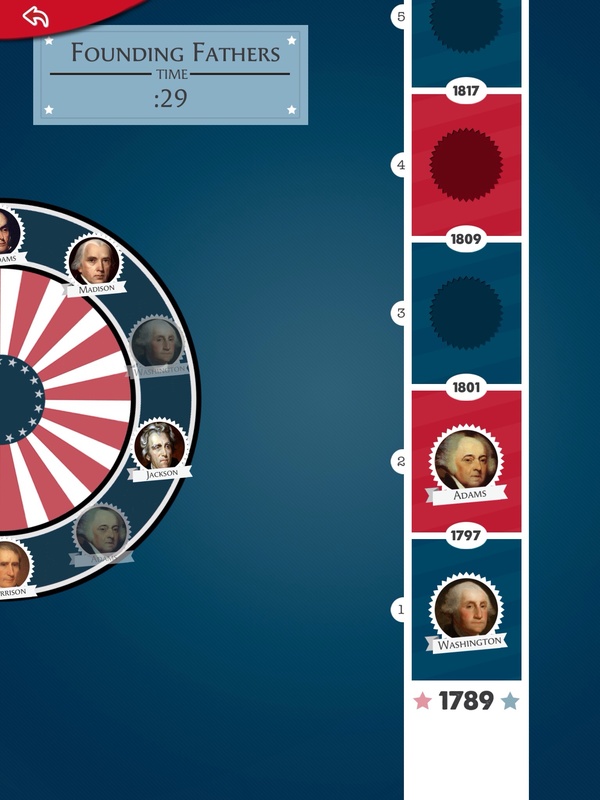 There are two modes: an exploration mode that allows users to see the Presidents in their proper places on the lists in each section, and a challenge mode where players must place each President in the proper sequence on the timeline. The Exploration Mode includes a brief biographical sketch about each President, the years that he lived and the time when he held office. The pictures of each are stunning and very clear. The Challenge Mode can be tackled in any of four eras (Founding Fathers, Civil War, Turn of the Century and Modern Day) or the entire list at one time. A built-in timer records the length of time it takes the player to get all of the pictures onto the time line in the correct order. If any are out of order when all are in place, the app returns just the incorrect pictures to the selection side so the user can continue until all are in the correct places. While this app isn’t really intended to be entertaining, it is fun to use. Users can have the challenge of trying to beat the recorded best times on the sections or the entire list. When Presidents are placed correctly, the app acknowledges correct placement when it checks the entire timeline by framing the picture and making a positive sound. Students might find this app to be even more engaging if there was a way to do head-to-head competition. Studying the order of the Presidential terms is not typically high on kids’ list of pastimes, so app developers might want to consider this improvement. This app is a good value, especially if you have a student who is interested in history or one who needs to learn the order of the Presidential terms. It would be an excellent investment if you have multiple students in your household or are working with a classroom where this information is a part of the curriculum. The task is ideal for visual and kinesthetic learners who benefit from seeing and manipulating information. This app is very child-friendly, even though it is intended for older students. There are no outside advertisements, no links to the internet, no connection to email or social media and no in-app purchases. The app is self-explanatory, so there are no adult instructions.